Dave offers a discount of 50% on their first / introductory lesson! From being a chorister at Westminster Abbey to playing sessions for various bands in London, I've been a musician for most of my life. 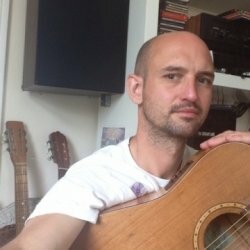 As a self-taught finger-pick guitarist I have been writing and recording for over fifteen years. My tastes are pretty varied but for an idea of the sort of music i make myself you can check out my soundcloud or myspace. Having taught my nine-yr-old the basics on guitar 2 yrs ago I have now had a variety of students ranging from ages 5 to 65! I believe an open-minded and relaxed attitude is essential in both tutor and tutee. A desire to produce a nice sound is more important than clinical technique in order for pupils, especially new ones, to really engage and enjoy making music. Naturally the lessons will be tailored to the pupils individual tastes and ability and if I think they would be better served elsewhere I will say so. DaveFrom Rhoda (5/5): A very patient and enthusiastic tutor, I really feel I'm making progress. DaveFrom Claire (4/5): Very patient and helpful.